A. What’s that? You don’t know about “Mobi-chan”? Then please allow me to introduce you. “Mobi-chan” originates from an old Capcom arcade game called “Side Arms” where it was controlled by the player, or in other words, it was the hero character. It was such a cool “Mobile Suit” design that he became a sort of mascot for Capcom, and came to be known as the lovable “Mobi-chan”. A. Hm, that’s a very good question. “Strider” actually started out as a term meaning a “field hand” or “field-worker”. A present-day ninja like Hiryu and his compatriots are quite fittingly referred to as “Striders”. Q. Do robots like those made by Dr. Wily or Dr. Cossack have self-awareness, and can they talk? And do they run on solar energy like Rockman does? A. I take it you’d like to know if Wily and Cossack’s robots possess “sentience”? Naturally, they each have a “consciousness”, although the level of every “cognitive circuit” embedded inside each one of them varies, producing as many different “personality” types as found in people… Just like you or I, they can speak, and have emotional responses like shyness, or anger, just as we do. Regarding their energy systems, many of them do utilize “solar energy” in some way. Q. I have a question for you, Doctor. 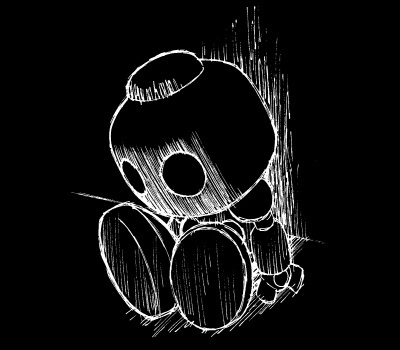 What happens to the boss characters after they are defeated by Rockman? Are they just scrapped…? Or, do they get rebuilt? A. Ha ha ha… Not to worry! The robots’ parts are normally recovered and recycled. Especially boss-class robots, as long as their IC (Integrated Circuit) Chip’s “cognitive circuit” is not completely destroyed, it’s possible to rebuild them any number of times. Of course, Rockman takes great care never to damage the “cognitive circuit” of his enemies even while he’s battling them! Q. Is it true that Rockman 3‘s Shadowman is an extraterrestrial robot? A. I’m afraid even I don’t know all the details, but that does seem to be the case. In any event, the metal body of “Shadowman” does not match any material found on Earth… My conjecture is that he may have been created and left behind by some “ancient civilization” on another planet. Then it’s likely that Wily remodeled him to suit his own maligned purposes. Q. I read that Quint is supposed to be the future Rockman who was remodeled, but does that mean that in the future Rockman loses to Dr. Wily? A. Ah… That’s quite an inexorable situation. As we came to understand later on, in the future that “Quint” came from even Wily himself had reformed, resulting in a peaceful world that was free of conflict. As would naturally occur in such a setting, the “battle functions” had been already been removed from “Quint”. And that’s when our Wily showed up with that time machine and attacked, or so we understand. Q. You wrote before that Rockman can use either arm to fire, so how come in the game he never uses both arms to attack? Wouldn’t that be more powerful than just using one at a time…? A. It certainly would create a powerful attack… Unfortunately, however, it is currently infeasible to do so. Because the energy the “Rockbuster” puts out is considerably strong, it’s not possible to fire more than one shot at a time. If Rockman were to fire from both arms at once, Rockman’s body would undoubtedly overheat I’m afraid. Q. Is Rockman’s charge shot created using solar energy somehow? A. Rockman’s charge shot discharges condensed solar energy. Oh? You’d like to better understand? …Hmm, let me try to explain. To “condense” in this case means to “come together and shrink down”. If we could assemble all the solar energy we bask in every day into a single compressed ray, we’d have made an incredible energy. Perhaps sometime you’ve tried lighting a fire using the sun and a magnifying glass? It is the same basic principle that applies to both. The Doctor is really smart, there’s no question he can’t answer! Q. In “Breath of Fire” I can’t find the Dragon Blade anywhere, where do you get it from? A. Ah yes, so that’s where you’re stuck? Have you tried going “fishing”? Hold on, I mean fishing inside the game! There’s actually a place you can really reel them in! Let me tell you a bit more. Try the water well. By the way, you’re going to need a good fishing rod, and that could be expensive. So, you’d best seek out the best pole, and you’re sure to uncover the prize. Keep at it! Q. What in the world is the language that Ryu and the others use to communicate! Don’t tell me that Blanka can speak Japanese!? A. Hmm, I see, and I can understand your confusion. But even though it would be a great thing to have, I’m afraid there is no single “language that everyone speaks”. The correct answer is that they are each speaking in their own mother tongue. In other words, they’re really just “talking to themselves.” (Although when two people facing each other are locked eye to eye in battle there is a certain understanding of one another which occurs). Q. How can I know I’m keeping up to date with all of Capcom’s latest software? A. When you want to be sure, you should give Capcom’s Telephone Service a call! You can hear all the latest news and information on Capcom’s products and services 24 hours a day. It’s very useful, so give it a try! Don’t stop sending in those questions! Too bad for whoever sent in more questions, since they’d never see the light of publication. But enough moping over unexpected magazine cancellations, let’s review! Mobi-chan has cameos in tons of Capcom titles, including the Rockman arcade games. If the connection between the name Strider and a street philosopher threw you, it’s basically “Street” + “Writer” or “Rider” = “Strider”. Future ninjas keeping it real. Dr. Right confirms that the Wily Numbers can all think and talk for themselves and have their own personalities, which was less apparent back then before they started talking regularly in the games. And we’re told how the robots survive their apparent destruction by recovering their IC Chips. 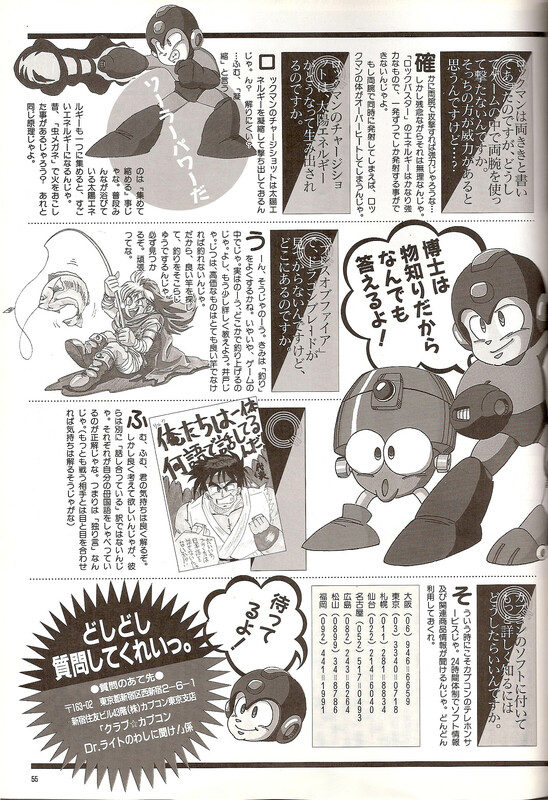 The term IC Chips also appeared as the pieces that Rockman collects from his enemies in Shigeto Ikehara’s Rockman mangas to gain their special weapons. Presumably, “IC” stands for “Integrated Circuit”. This column also addressed two of the most mysterious boss robots to ever appear, Shadowman and Quint. Even Dr. Right seems to be at a bit of a loss surrounding their origins, but his after-the-event knowledge of Quint makes me wonder if perhaps the original Quint was recovered and sent back to his peaceful future after all. 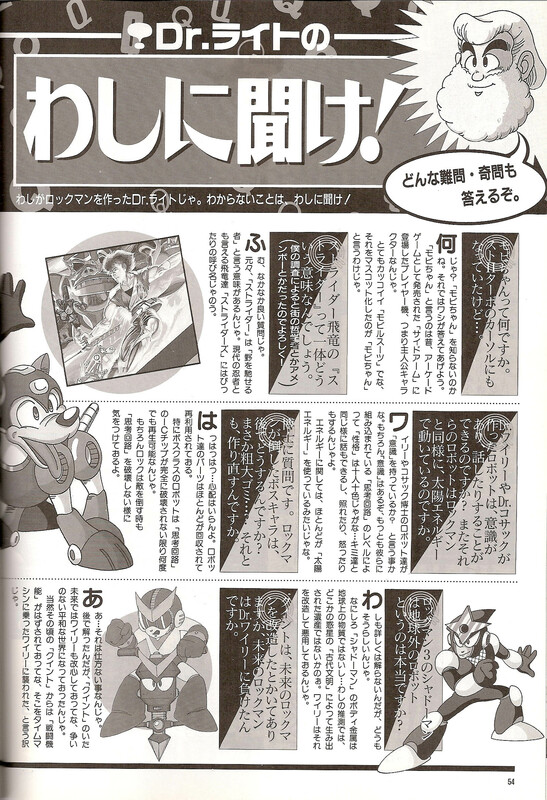 Of course maybe they just managed to interrogate that much information from Wily himself. Dr. Right’s explanation as to why Rockman never uses both busters at once would later be used in the climactic final battle of Super Adventure Rockman, where **SPOILER ALERT** Rock fires off a Double Rock Buster that destroys the supercomputer Ra Moon, but at great risk to his own health. Then we had some more techno-babble about how the fictional Rockbuster works, and a brief summary of how to find a secret weapon in Breath of Fire. I’ve never played the first Breath of Fire title, but I really enjoyed the second one. Maybe I’ll give it a try sometime. As usual the good Doctor ends with a promotion for Capcom’s regional Japanese phone service. I wonder if any of those are still in operation nowadays? But I’m not going to pay the long distance to find out. 5 Comments to "Ask Me 3: The Final Lesson!?" So, technically, it was known that Quint was future!Megaman long before RnF? Maybe if this was shown to certain fanbrats, they’d stop insisting that Quint’s just another Copy robot? It was known in Japan since Rockman World 2 came out (or even a bit before thanks to J-gaming mags). But as to whether this could convince anyone, that might depend on whether they’re just misinformed or fully in denial about it. 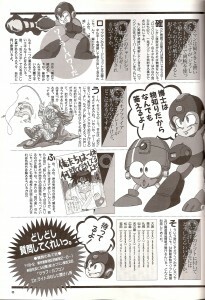 Quint is a little hard to swallow as the future Mega Man, even though it is the official story. But if that green midget from Captain N can be Mega Man, then Quint can be too, I say. It’s surprising how those magazine columns stick to the facts when even the North American manuals sometimes get it all wrong. The usage of the MegaBuster is one clear example. I’ve had to explain that point more than once, and I always make sure to point out the Super Adventure Rockman case!